Tempeh is a wonderful source of high protien that is made from soybeans. It is high in essential fatty acids, numerous vitamins and minerals and has high isoflavones and fiber. Tempeh is known to promote gastrointestinal health, stabilize blood sugar, lower LDL(bad cholesterol) and raises HDL (good cholesterol). It is also know for helping women ease through menopause and for lowering the risk of prostate cancer in men. Preheat oven to 375. Place tempeh in a large mixing bowl with Shoyu for 10 min stirring occasionally. Place tempeh and marinade in a well oiled 9″ x 13 ” casserole dish and bake for 20 minutes, stirring occasionally. Remove from Pan. Place oil in a 3 qt pot on medium high heat. Ad onion and garlic, cool for 5 minutes, stirring frequently. Add shitake mushrooms and 1 C of crimini mushrooms, cook for 10 more minutes, stirring occasionally. Ad paprika and cayenne pepper, remove from heat and blend in a large blender with soy mild until smooth. Return to pot. Add tempeh and remaining 2 Co f crimini mushroom and cook over low heat until the mushrooms are cooked, approximately 10 min, stirring occasionally. be sure not to boil. Add remaining ingredients including tempeh, mix well and remove from heat. Serve over 3 C pasta, rice or quinoa. Garnish with a dollop of soy sour cream. Additional chopped Italian parsley and a dash of paprika. Tempeh may be replaced with an equivalent amount of tofu or seitan. Heat oil in pan and brown the pork. Remove the pork. Add onions and garlic and saute about 6 minutes until golden. pepper, potato, tomatoes and broth. Return the pork to the pan. Reduce heat and simmer1 hour or in oven at 350. Season with salt and pepper if desired. 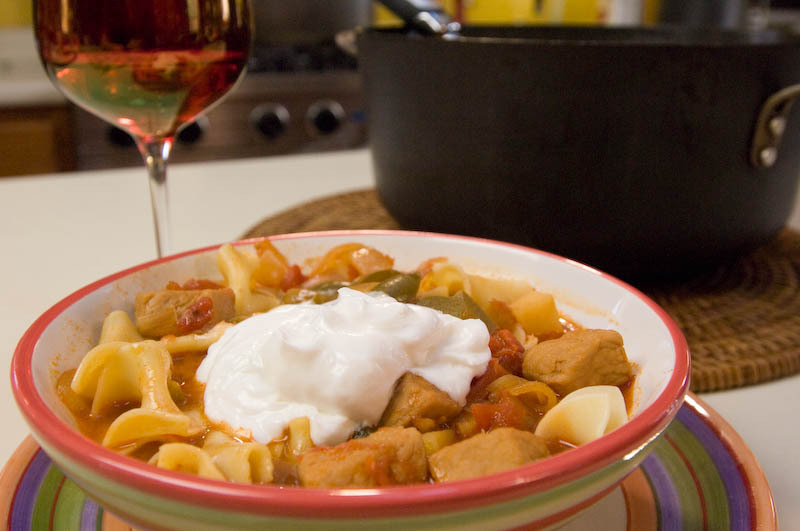 Serve over noodles with a dollop of sour cream. Pour three cups of hot, not boiling water in a large shallow bowl. One at a time, immerse the rice paper wrappers in the hot water for 10 seconds to soften, then place on a slightly damp towel. The rice paper is very delicate, don’t soak them any longer or they will break apart. Keep them covered while you work to prevent them from drying out and curling. 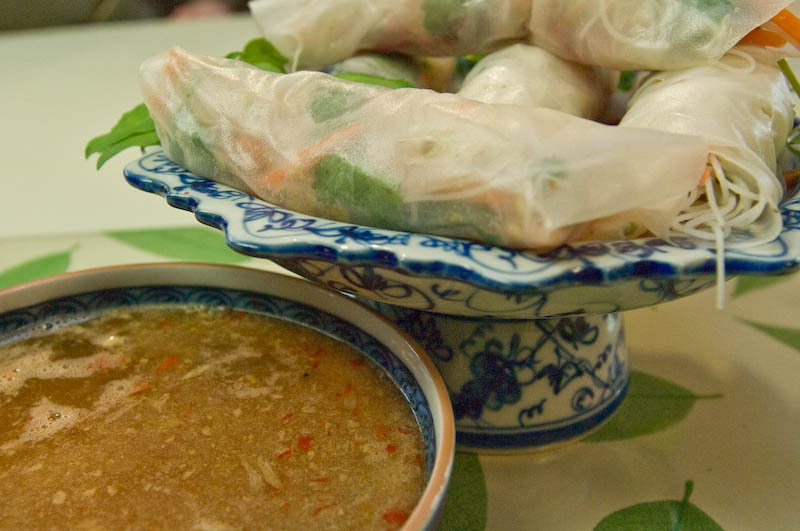 To form the rolls, lay a rice paper wrapper on a flat surface. Grab a small amount of the cellophane and vegetable mixture and lay it across the bottom third. Use less filling than you think you should, if you overstuff the wrapper, it will tear. Carefully fold the bottom of the wrapper up to cover the filling. Fold in the left and right sides, then tuck and roll it over once. Lay two mint leaves on top, then tuck and roll it over to close the whole thing up like a tight cigar. The mint leaves should show through the transparent rice paper. Arrange the finished rolls on a platter and cover with a damp towel. 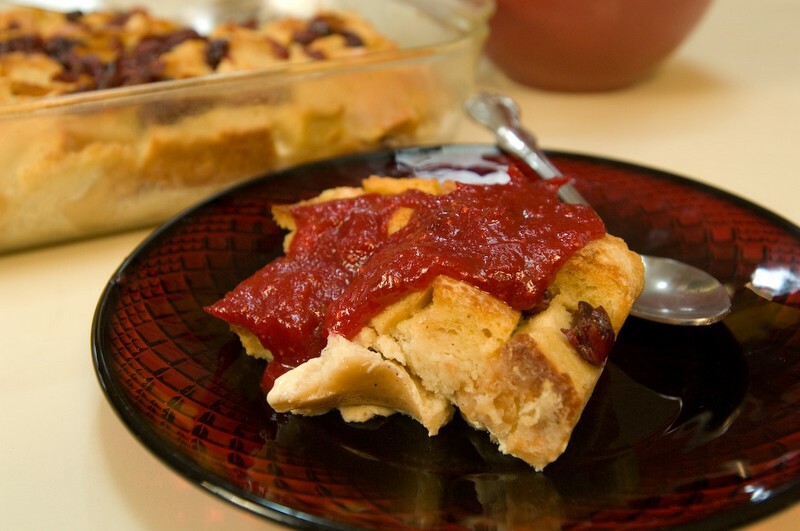 Click here to view this recipe on a single page. Butter casserole dish and place haddock pieces in. Cover bottom of dish with milk. Sprinkle with lemon pepper and top with breadcrumbs. Dot with butter. Bake in 350 degree oven for 15-20 minute until flaky. Serve with 1 box of rice pilaf, cooked according to package directions. 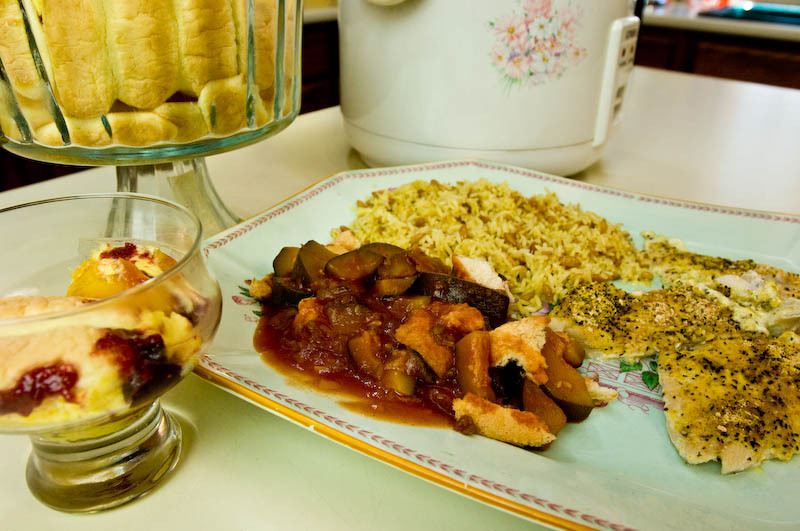 Place zucchini in casserole dish and top with bread broken into pieces. Bake till bread is lightly toasted. Heat olive oil in pan. Add peppers, asparagus, lemon zest and 1/4 tsp salt. Stir until vegetables are softened, about 6 minutes. Remove. Add 2 tsps olive oil and garlic to pan and cook, stirring, until fragrant, about 30 seconds. Add shrimp and cook, stirring for 1 minute. Whisk broth and cornstarch in a bowl until smooth and add to pan. Cook, stirring until thickened and shrimp are pink and cooked, about 2 minues. Stir in lemon juice and parsley. Serve with the vegetables. Place panko, eggs and flour in separate bowls. Season both sides of cheese with slat and pepper. Dredge each slice in flour, then egg and then panko. Dip cheese a second time in egg and panko for a double crust. Healt 1/4 cup oil in pan over high. Add cheese and fry until golden, about 2-3 minutes per side. Transfer to a paper towel lined plate. Boil 1/2 lb of thin spaghetti according to package directions. Drain and put on a large platter. Top with the breaded mozzarella. 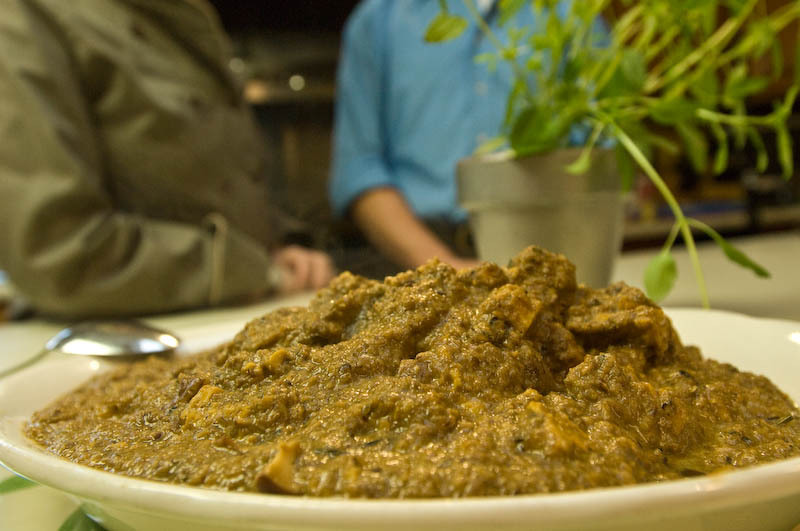 Pour shirmp and vegetable mixture over the top and serve immediately. Mix altogether in a bowl and set aside. Fry shrimp about 3-4 minutes at 350 degrees in peanut oil. Butter and toast some buns. 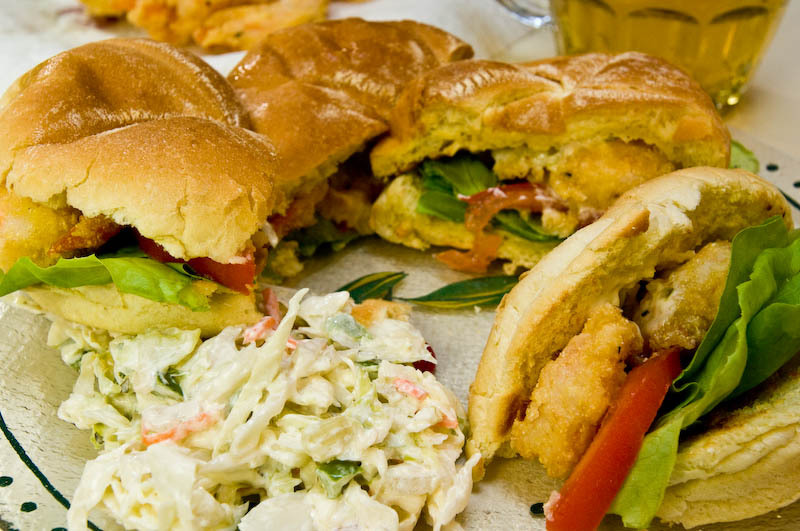 Put lettuce and sliced tomato on roll, top with shrimp and home-made tartar sauce. Serve with a side of cole slaw. 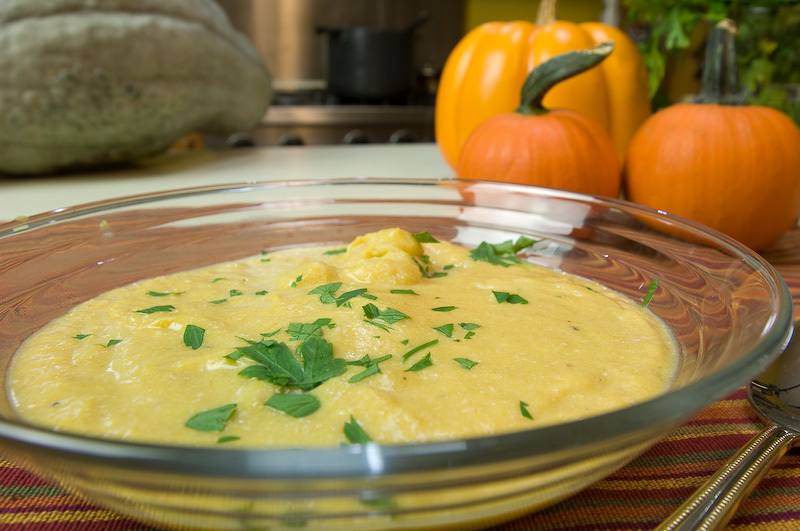 Pam may have had to use a chain saw to cut it, but the squash produced a wonderful soup…well worth the effort! Cook squash – preheat oven to 375 degrees. Add water to a large baking sheet and place the squash cut side down (seeds removed). Pierce with a fork and bake, covered with foil for about 45 minutes to one hour. Cool squash slightly, then scoop flesh out of squash and set aside. In a large pot, melt the butter over medium high heat. Add the onions, bay leaves and sugar and cook, stirring until onions become soft about 10 mins. Add the ginger, cinnamon, nutmeg and allspice and cook for one minute, stirring constantly. Add the squash, chicken stock, salt and pepper and stir to mix well. Bring to a boil, then reduce to a simmer and cook until the soup is thickened and slightly reduced, about 30-45 minutes. Stir in the ricotta cheese and the milk and cook another 10 mins. Discard the bay leaves and puree the soup. Mix all ingredients well until smooth. Moisten spoon in soup and drop by half teaspoonfuls into soup. Boil 2-3 minutes. Serve soup with chopped parsley on top. The French sure got this one right. Thaw the pastry at room temp for about 40 minutes or until it is easy to handle. Heat oven to 375 degrees. Lightly grease a baking sheet or line with parchment paper. Mix egg and water together in a small bowl. Unfold pastry on a lightly floured surface. Roll into a 15 x 10 rectangle. Cut the dough in half lengthwise. Cut 1/2 of the pastry into 4 5×3 rectangles. Place the rectangles 2″ apart on prepared sheet. Repeat with other half of dough. Bake for 15 minutes or until golden. Remove from oven and cool on wire rack. Heat butter in a skillet over medium heat. Add apples, brown sugar, and cinnamon and cook for about 10 minutes until apples are soft. Stir constantly. 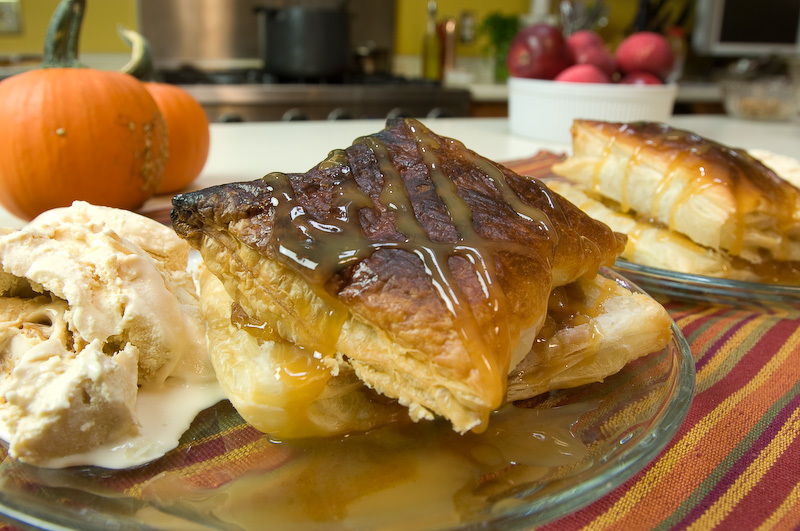 Split each pastry in half, forming two layers. Place one layer on a serving plate. Spoon about 1/2 cup of the apples on top and top with 1 tbsp caramel sauce and pecans. Top with remaining layers. Drizzle with caramel sauce and serve with ice cream. MAKE AHEAD TIP: Bake the pastry rectangles early int he day or up to 24 hours in advance. Bake for 10 minutes at 300 degrees or until crisp. Apple mixture also can be made in advance and refreigerated up to 24 hours. Reheat in microwave on high for about 2 minutes or until it is hot, stirring once. 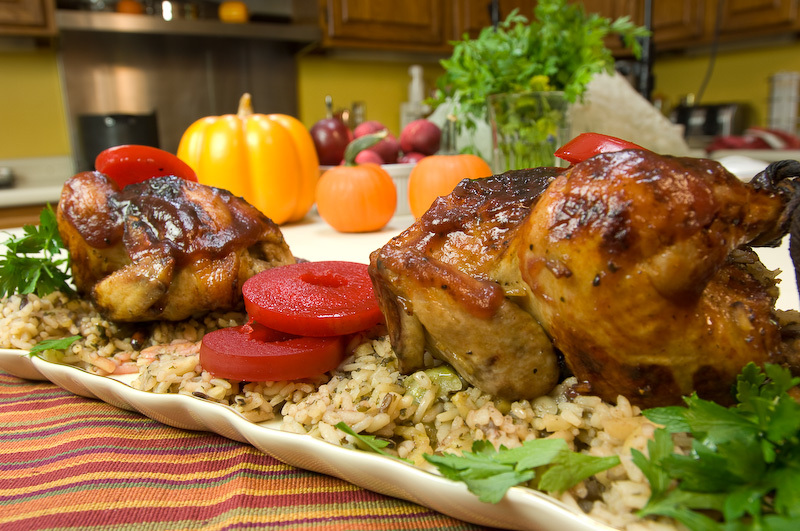 All the big-bird flavors of Thanksgiving in a small, friendly package. 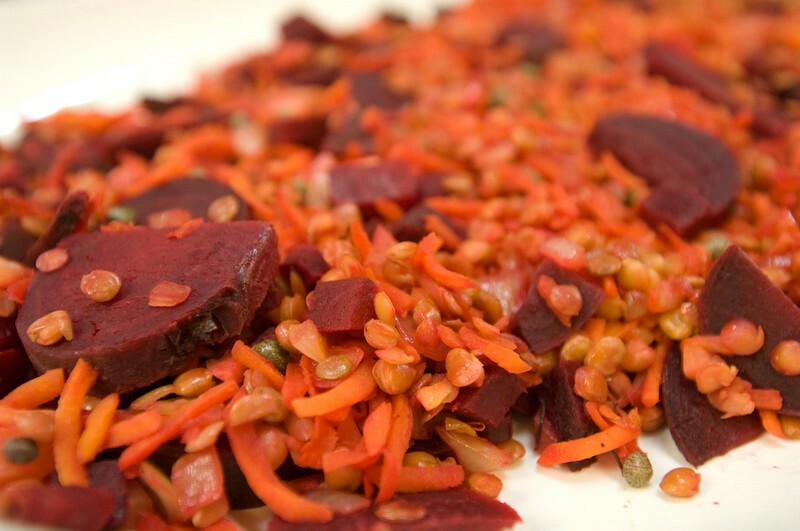 1 box fast-cooking long grain and wild rice, 6 oz. 1 can jellied cranberry sauce, 8 oz. Prepare rice according to package. Stir in celery, almonds and HALF of cranberry sauce; cool. Preheat oven to 425 degrees. Spoon about Â¾ cup rice mixture into cavity of each hen. Tie drumsticks together with string and place on rack in roasting pan. Brush each hen with olive oil. Roast hens, basting occasionally with oil, 35 to 45 minutes or until done. Internal temp 180 degrees F for hens, center of stuffing 165 degrees F.
Heat remaining cranberry sauce in saucepan until melted. Remove hens from oven; remove and discard string. Spoon melted cranberry sauce over hens before serving. Refrigerate leftovers-if any!!!! A fun, easy recipe that you can make with the kids. Bring water, butter and salt to a boil in a pan. While whisking the water, slowly add the polenta and keep whising until thick, about 3-4 minutes. Immediately pour into a prepared (greased mini loaf pan or flat sheet pan) pan and spread as evenly as you can to about a 1/2″ thickness. Set aside for about 15 minutes to set while you make the topping. to brown an crisp a bit. Top with a little bit of the onion mixture and then some crumbled blue cheese. Serve at room temp. 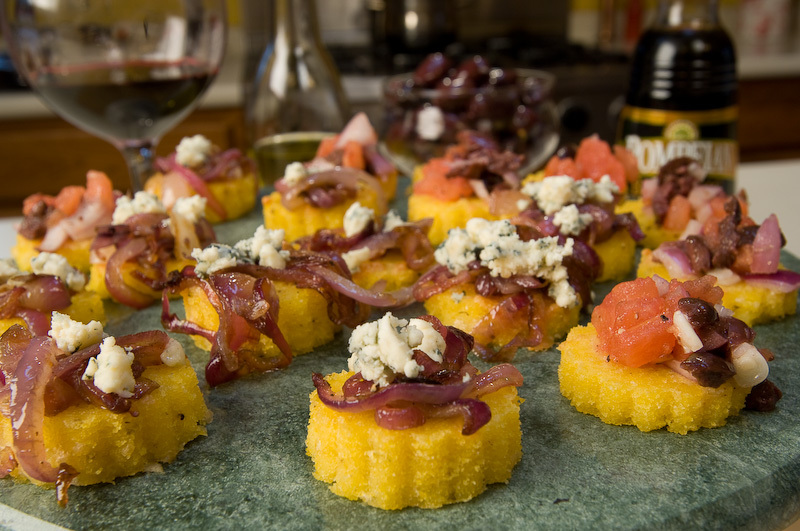 NOTE: The polenta (uncut and unbroiled) can be made the day before, covered tightly and refrigerated. The onion mixture can also be made the day before, covered tightly and refrigerated. Bring both to room temp before proceeding. Mix altogether in a bowl and let marinate for at least 30 minutes before using. Can be made a day ahead of time, covered tightly and refrigerated. Drain off any excess liquid before using. Boil beets till still hard–not soft–retain water–chop beets into 1″ pieces. Saute onions,carrots,garlic in 3 TB olive oil–until soft. Reduce, then add sherry vinegar. Combine water and spices in large saucepan, bring to a boil and simmer for 15 minutes. Add juices and bring just to boil. Remove from heat. Strain punch through a sieve or colander into a large preheated punch bowl (or large crock-pot set on very low heat) Place a mixture of a few raisins and Craisins in the bottom of each cup. 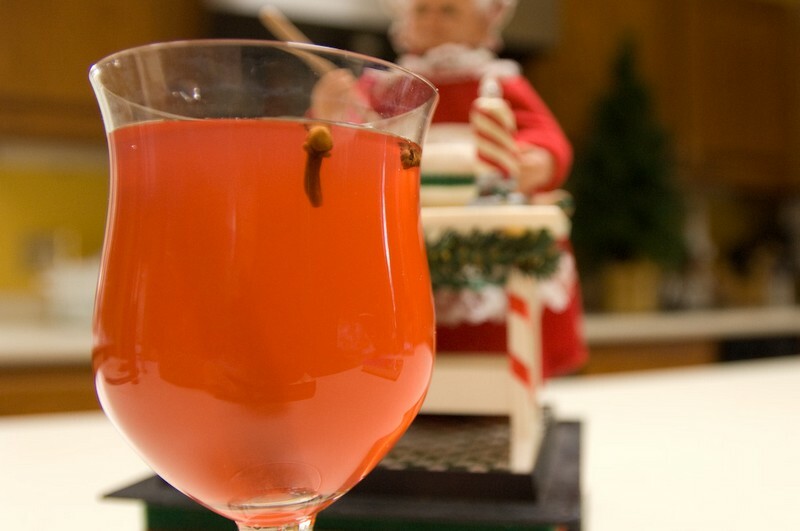 Allow guests to ladle their own punch into garnished cups. Roughly chop the rinds and stuff into the duck. 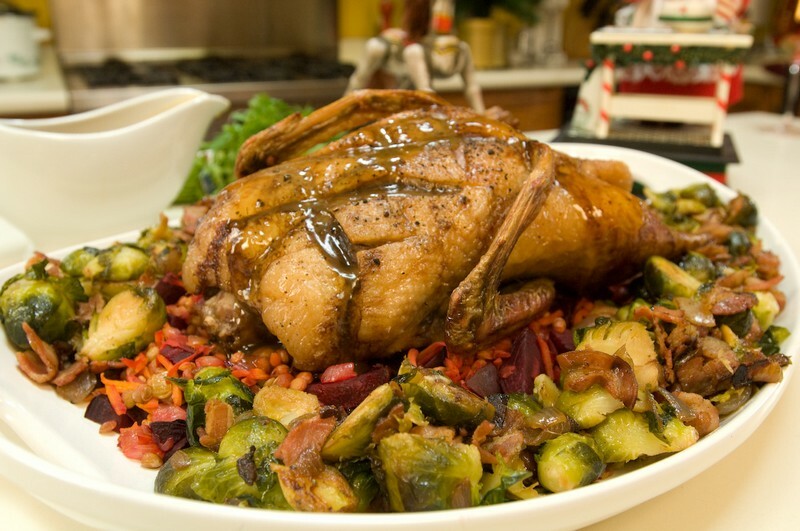 Place the duck on a rack in a pan with about 1/2″ water in bottom. Bake until golden and slightly crisp, about 30 minutes. Reduce heat to 300 and continue cooking the duck for about 1 hours or until 170 degrees. In a heavy saucepan, combine the orange juice, zest and sugar over medium high heat and reduce to 3/4 cup. Add bitters and set aside. Add stock to orange mixture and simmer over low heat for 10 minutes to reduce. Add arrowroot mixture to thicken. Remove duck from pan and discard any accumulate fat. Remove rinds from duck cavity. Let rest 10 minutes before carving. Add the orange liquer to the roasting pan and place on heat. Deglaze the pan and reduce for about 5-10 minutes. Add to the orange sauce. Serve with the duck. Garnish with orange slices and or candied orange peel. Butter 9 x 13″ pan. Put bread cubes in pan. Mix eggs, sugar, cinnamon, nutmeg, salt. Add milk and blend well. Pour over cubes and weight it down for about 20 minutes. Scatter cranberries on top and push down to submerge. Put pan in another pan and add 1/2″ water. Bake 350 45-55 minutes or until knife inserted in center comes out clean. Serve with sauce. In a saucepan, bring maple syrup and sugar to a boil. Cook for 3 minutes. Add cranberries and cook until their skins burst and begin to pop. About 6-8 minutes. Cut butter into pieces. Remove pan from heat and whick in the butter and then the bourbon. Sauce can be served immediately or refrigerated up to one week. Reheat gently and thin out with 2-3 tbsps water before serving. In a large pot of boiling, salted water cook the brussels sprouts for 5 minutes. Drain and rinse with cold water. In a large skillet, cook the pancetta over medium heat, stirring, until crisp. 8010 minutes. Drain, reserving the fat. Add 1 tablespoon extra virgin olive oil to the skillet with the reserved fat, then stir in red onions and cook over medium heat, stirring until caramelized and soft, 8-10 minutes. Transfer to a bowl. Add last tablespoon extra virgin olive oil to skillet and increase heat to high. Add the brussel sprouts and cook, tossing, until brown and crispy on the outside, about 5-7 minutes. Remove from heat and stir in onions and pancetta; season with salt and pepper and dash of nutmeg. 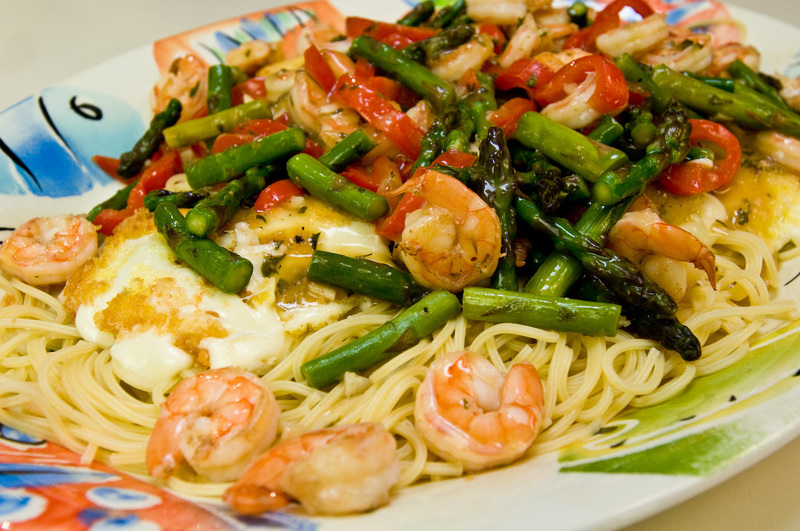 Garnish with splash of balsamic vinegar or grated parmesan cheese, if desired.